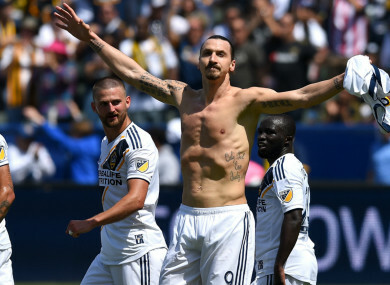 LA Galaxy striker Zlatan Ibrahimovic. Email “#DaretoZlatan - Ibrahimovic joins Ronaldo and Messi in 500 club with outrageous goal”. Feedback on “#DaretoZlatan - Ibrahimovic joins Ronaldo and Messi in 500 club with outrageous goal”.